The United States' second president, John Adams, was the first to occupy the White House. Since then, each presidential family has left its mark on the outdoor living spaces of the executive mansion, whether it's been through planting trees and gardens or adding swimming pools and outdoor sculptures. 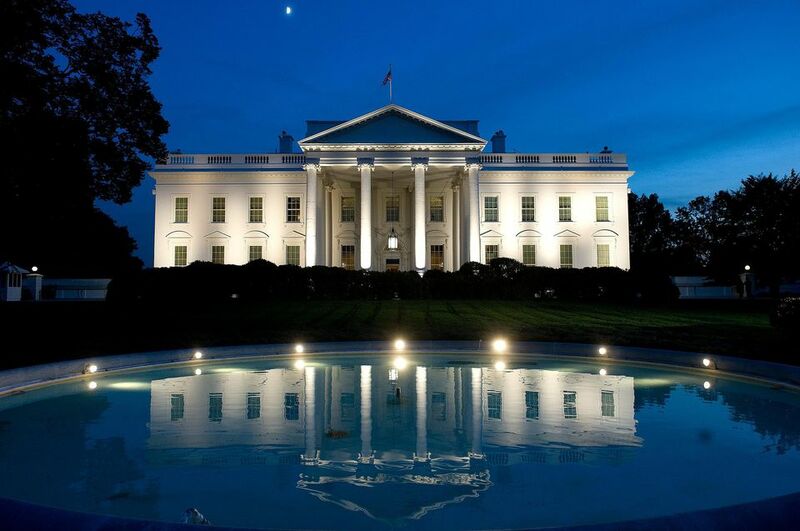 At various times, the White House has had indoor and outdoor swimming pools, a hot tub, reflection pools, fountains, ponds and other water features. So, how many pools has the White House had? Does the hot tub installed during the Clinton administration still exist? Is FDR's indoor therapy pool long-gone? And what's this we've heard recently about the Jonas Brothers autographing the wall of a White House pool that also bears other famous signatures? This slideshow sets straight a few questions and provides a historical look at the water worlds of the White House, Camp David, and other presidential retreats, along with the people who enjoyed these features and amenities during their stay. President Gerald and First Lady Betty Ford were the first and only First Family to build an outdoor swimming pool at the White House. Ford was athletic and aimed for daily workouts in the pool. President Ford and his family (including his dog, Liberty) also enjoyed a dip in the figure-8 pool when at Camp David in Maryland (pictured). President John F. Kennedy's father, Joseph P. Kennedy, commissioned artist Bernard Lamotte to paint this scenic mural on a wall of the swimming pool that was built for President Franklin D. Roosevelt. Mirrors adorned the opposite wall of the indoor swimming area, which reflected the mural. Kennedy would often go for a swim after lunch​. Franklin D. Roosevelt grins as he treads the healing waters at a pool in Warm Springs, Georgia in 1925. Roosevelt was diagnosed with polio in 1921 and put aside his political career for a few years to rehabilitate. Much of his treatment included pool therapy, which helped him regain strength, especially in his arms. Despite remaining a paraplegic, Roosevelt persevered in politics, becoming governor of New York for two terms before being elected president in 1932. Franklin D. Roosevelt also swam frequently at the Val-Kill swimming pool in Hyde Park, New York, where he was photographed in July 1931. The casual redwood deck furniture with mustard and olive-colored floral-print vinyl cushions give no hint to the historical discussions that took place upon them in September 1978. For two weeks at the tranquil setting of Camp David, President Jimmy Carter mediated the negotiations between Egyptian President Anwar Sadat and Israeli Prime Minister Menahem Begin that led to the Egyptian-Israeli peace treaty of 1979. This was the first peace treaty between Israel and an Arab nation. If you look closely, you can see part of the swimming pool's handrails and diving board on the far right, next to Carter. Note the orange ashtray on the redwood table in the foreground -- it was standard to place plastic ashtrays on outdoor side tables to accommodate smokers poolside or on a deck or patio. Also, by the late 1970s, people were becoming more socially conscious about their smoking habits and often smoked outside. President William J. Clinton's dog, Buddy, retrieves a tennis ball from the White House pool. Showing his talent for multitasking, a sunburned President Lyndon B. Johnson celebrates his birthday on August 27, 1968, by cooling off in the pool with two of his favorites: mutt Yuki and Patrick Lyndon Nugent, the President's grandson. President Clinton's dog, Buddy, retrieves a tennis ball from the North Lawn pool, which is the decorative pool with fountains often seen in photos. This photo was taken February 9, 1971, and Camp David's in-ground swimming pool is shown in fine, frozen form with steam rising. It's a lovely scene, nonetheless, and displays the curvilinear, figure-8 shape of the large pool. 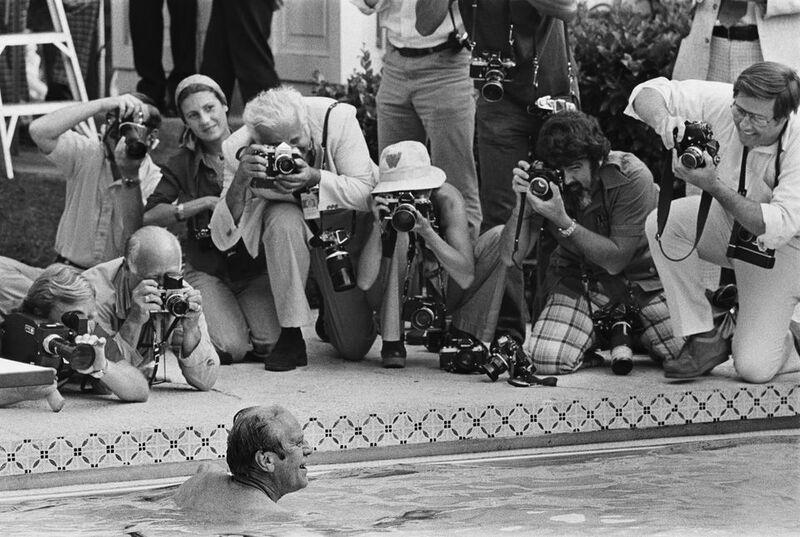 President Gerald Ford tries out the new White House in-ground swimming pool while the press covers his every move. An avid swimmer, Ford would sometimes conduct press conferences while getting his daily workout in the pool. The pool was built during Ford's administration. A solar blanket was installed during President Jimmy Carter's period in the White House. George and Barbara Bush stand near their Texas pool in 1978, before he became vice-president and eventually president. At this particular Easter Monday 1889, the North Lawn fountains were going at full blast. When they wanted to get some R&R, President Richard M. Nixon and his wife, Pat, flew to La Casa Pacifica, their West Coast Spanish-style compound in the charming South Orange County seaside city of San Clemente, California. Here, you can see a true Southern California Midcentury-style backyard with square concrete pavers and an inground swimming pool. This photo was taken on July 9, 1971. Note the no-frills, collapsible aluminum lounge chair upon which Nixon is reading the newspaper. The matching patio set in the background is nicely upholstered and is probably made by one of the more high-end outdoor furniture manufacturers of the period, like Brown-Jordan or Tropitone. Which Type of Pool Cleaner Should You Buy? What Type of Pool Is a Spool? What is the Best Way to Use a Swimming Pool Test Kit? What Are the 4 Types of Inground Pools? What is Diatomaceous Earth (DE) Used For?